Your creative Wordpress forms maker, build a responsive contact form in seconds with bootstrap CSS, with this easy to use Wordpress forms builder every kind of form is possible, contact forms, payment forms, autoresponders, article form, survey, captcha, multi page and more! Forms are responsive and display well on every device. Easily design your form using the drag and drop interface and preview how your form looks like before saving the changes. Extend your form over multiple pages or multiple tabs/steps for a better user experience. Easily accept most date and time formats using the Calendar field, connect multiple calendars to get date ranges and/or start/ending dates. All form fields types are available, text, textarea, password, radios, checkboxes and dropdowns, with many advanced features like AutoCompletion and auto resizing. Group your fields together in one row or divide a specific area into multiple columns, you have full control over how the form is structured. Run conditional actions when specific events occur, for example you can show/hide/disable fields when a button is clicked or a choice is made. Redirect to PayPal, use PayPal pro and process PayPal IPN response. Read, Add, Update or delete data from one or more database tables, and connect to external database. Easily upload and attach files to emails, select which extensions can be uploaded and control the maximum file size. Send any number of emails, encrypt the emails data if necessary (encryption requires server software), advanced email layout support, customize the email recipients, subject, from data and set CC and BCC addresses. Control who can access each piece of your form, you can even have permissions control applied per field. Translate and render your form in different languages based on your active website language. You can create custom PDF files and attach them to emails, and customize the PDF file contents to your liking. Add a Google address field to load full address from Google or Display a Google map on your form. Easily set any field as required and/or apply other validation rules or custom ones. Add Google reCaptcha for increased anti spam protection, or apply other security measurements to protect yourself against the spamming bots. Connect your form to other services using the CURL action, connect easily to services like payment gateways, mailchimp, acymailing and more. Switch data or loop data sets using the PHP, switch and Loop actions. Use the rich and easy to use api to capture and use request data and actions results any where in your form, this gives you endless customization possibilities. 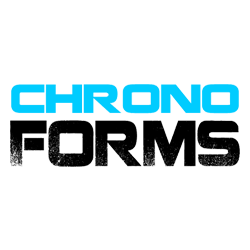 Whether you are building forms in Joomla or WordPress, you can use Chronoforms on both platforms, and if you decide to migrate from one platform to another, then your existing forms should work as normal. Integrate 2Checkout payments in your form, accept payments and process response passed by the gateway easily. Load your form in a popup when the page is loaded or after specific time or when an element is clicked. Easily create fields duplicators to let users add more info. Easily view, order and export the stored form submissions, you can also view per field statistics. Connect to Zapier using the Zapier webhook action and expose your form data to more that 700 of different services. Chronoforms uses the Semantic UI framework, selectively add any of the semantic modules and widgets to your form.